As we do most years, we’ll be setting up shop at both Barton Creek Square and Lakeline Mall throughout the holiday season to help get as many folks to donate as possible . 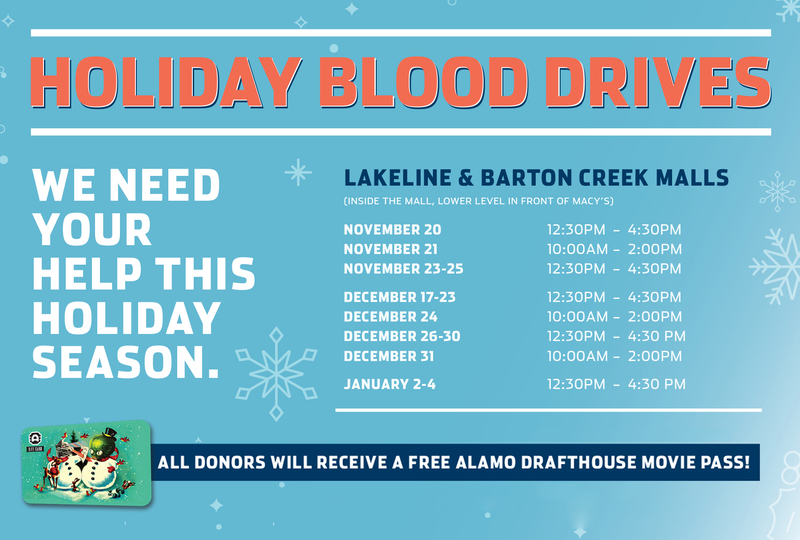 Better yet, we’ll be giving every single person who donates or attempts to donate at one of our mall drives a free Alamo Drafthouse movie pass. Take a look below at the dates and times we’ll be at each mall and click the date of the drive that is most convenient so you can see all of the details & make an appointment. We can’t wait to see you this holiday season! Feel free to make an appointment by following one of the links above, or you can just walk-in between shopping trips.